Google’s Google Glass project has been rolling out to new users over the last few months via the Google Glass Explorer competition, and is expected to hit retail status sometime next year, and now a few Google Glass early prototypes have been revealed. 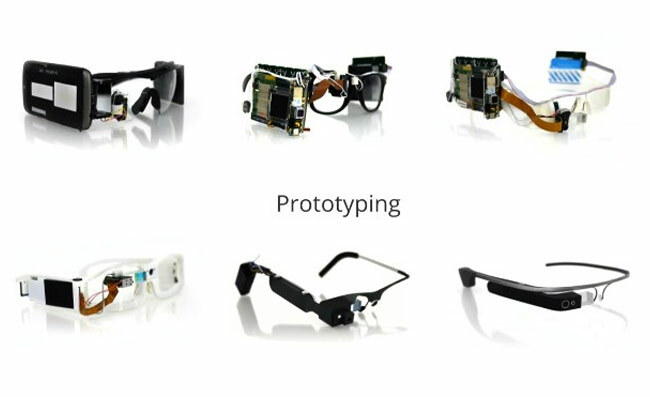 However the sleek design of the Google Glass eyewear, had to start somewhere and during part of the 7 Techmakers and a Microphone panel at Google I/O, during which a few Google Glass early prototypes were unveiled. Jean Wang, Project Glass Staff Hardware Engineer arrived to explain and revealed a little more about the design process behind the new Google Glass eyewear, and commented on the Google Glass early prototypes. The images above reveal the process from strapping a smartphone to the side of pair of googles to later more refined designs using 3D printed components. The video below is a copy of the Live streamed technical sessions from Google I/O . Brought to you by Google Developers Live.